You know those desks you see in magazines and on design sites—the immaculate ones with not a cable in sight? I don't have a desk like that, and my clients don't, either. We have laptops, whose power cables slither to the floor when we unplug them. My clients often have desks which don't face the wall, so the unsightly tangle or pile of cords that might otherwise be somewhat hidden down the back is instead in clear view. And since most desk designs ignore the cable issue, we're left to deal with it through various aftermarket products. A number of those products are designed to ensure that cables not currently in use don't slip to the floor. The one above is the MOS—the Magnetic Organization System. The magnets in the MOS will hold most cables in place, but there are also magnetic cable ties for any cables which need some help. The MOS itself is held in place by a layer of non-sticky micro-suction padding. 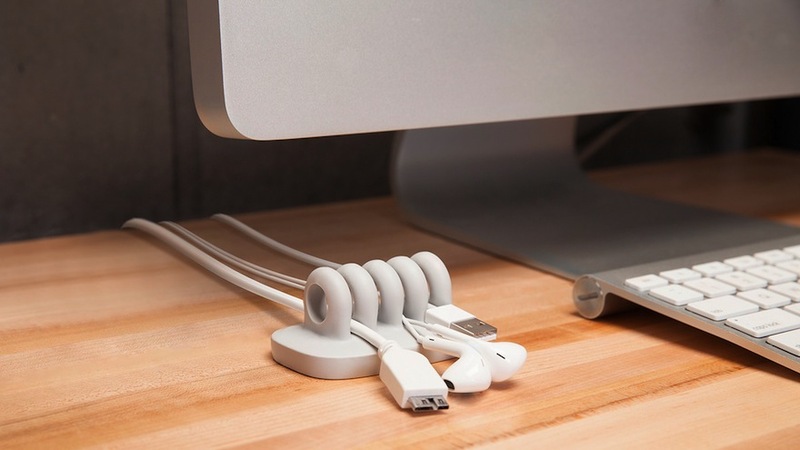 If you're designing (or using) a cable organizer, this might sound like the ideal way to affix your product to the desk—and in many cases, it is. Sewell even sells its AirStick tape, used in the MOS, as a separate product for other mounting uses. However, the MOS needs a clean, flat surface for that suction to work, and it won't work on something like unfinished wood, which is porous and doesn't allow the suction to form. The Bluelounge Cable Drops each hold a single cable. These attach to the desk with an adhesive, which means the drops cannot be repositioned—end-users will need to carefully consider where they want to attach them. Although Bluelounge provides instructions for removing the adhesive, people might still be hesitant about using this on an expensive desk or an antique one. And one more design consideration: These come in a variety of colors, including white—darker colors might be a better choice for a finish which can absorb dirt. 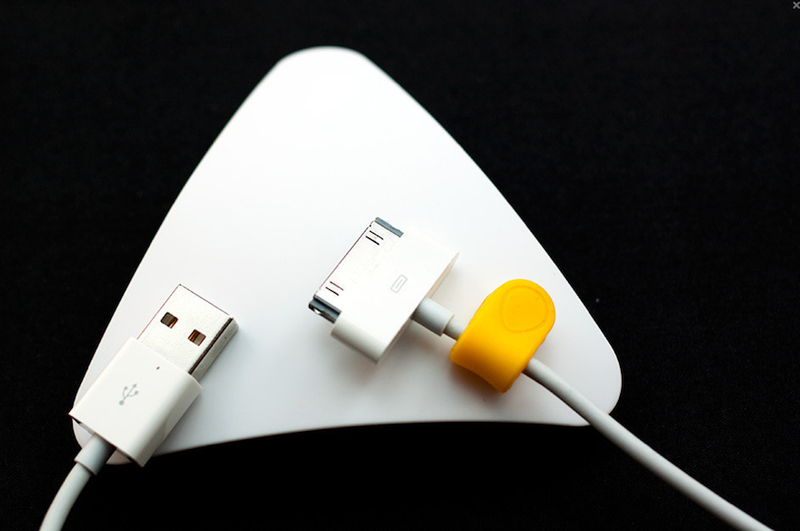 Sumo, also from Bluelounge, is described as a paperweight for your cables. Like the MOS, it uses micro-suction pads to stay in place and can be repositioned as needed. There are two grooves underneath to help keep the cables in place. This raises another design issue: How large of a cable should the device accommodate? Some people have said larger cables don't fit in the Sumo very well—but a product designed to accommodate larger cables might not grip smaller ones firmly enough. Steven Stewart, who invented Cordies, was also looking for a paperweight for cables. 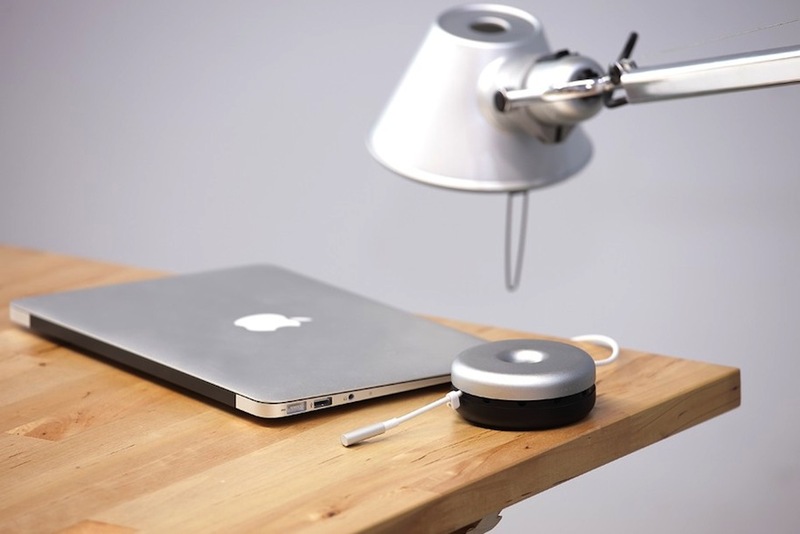 This design uses a weighted rubber bottom rather than an adhesive to stay in place on the desktop. A few end-users have complained about it moving around or falling off the desk on occasion—one said it was a problem on a glass desk—but most seem really happy with it. And it provides a solution for those desks where suction-based options won't work. The Dotz Cord Catcher has a "tacky rubber grip base"; if it loses its grip, you "simply rinse with water, pat dry and reapply." Like the Cordies, it's designed to handle four cords. The QooQi, pronounced "cookie," comes from 2040 Design Studio. 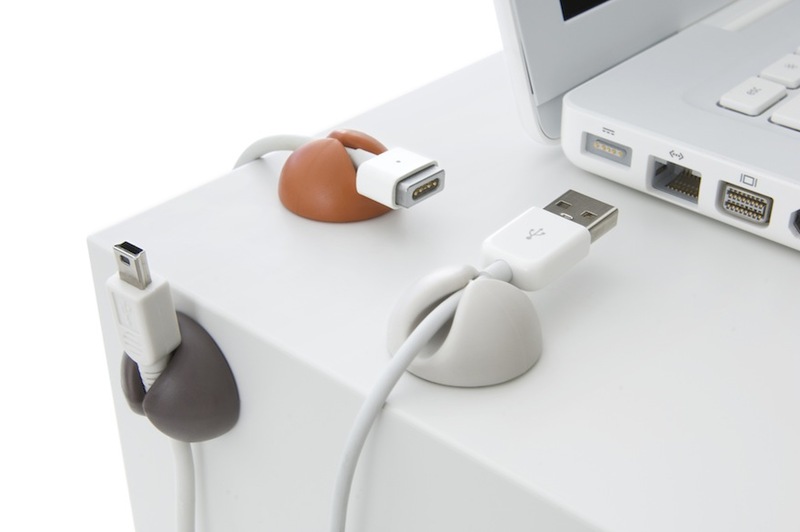 A QooQi holds up to five cables; it's held in place with "nano pad technology" which works on any smooth surface. Each QooQi is made from a single piece of aluminum, "knurled on the sides and edges for extra grip." They're also really small—less than two inches in diameter. But keeping the cords from falling off the desk isn't the only cable challenge that end-users face. 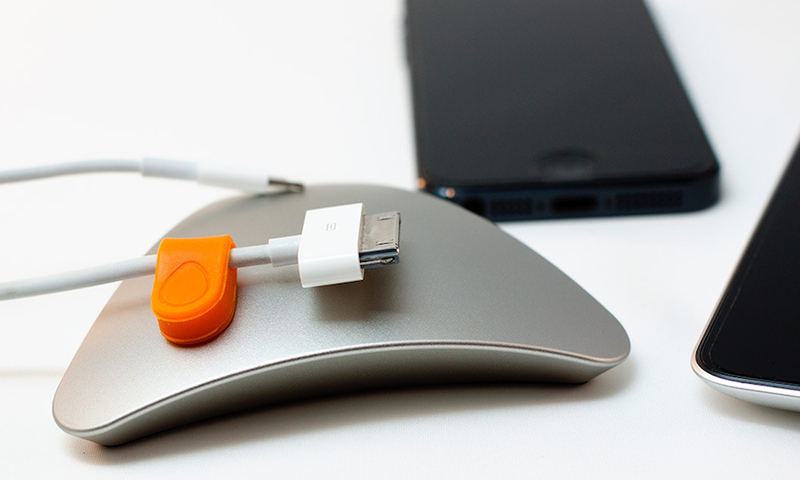 Another one is overly long cables, and products like the Cable Turtle can help with that. Designed by Flex, the Cable Turtle is even part of MoMA's collection. The AppleCore looks similar to a Cable Turtle in its open state. 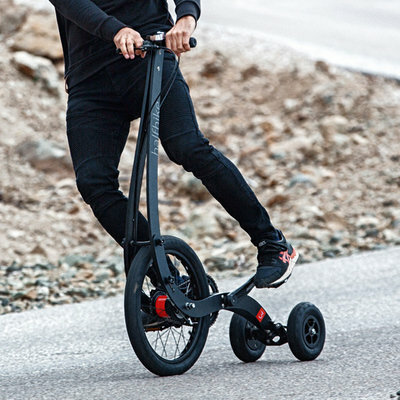 Fun stuff: The company has shared 32 images illustrating its creative process for developing this product. The Just Mobile Donut has an aluminum lid and a plastic base. It's specifically designed for selected Apple products, since it comes with its own Apple-certified iPod/iPad/iPhone cable (but not the Lightning-to-USB cable you'd need for the newer products). 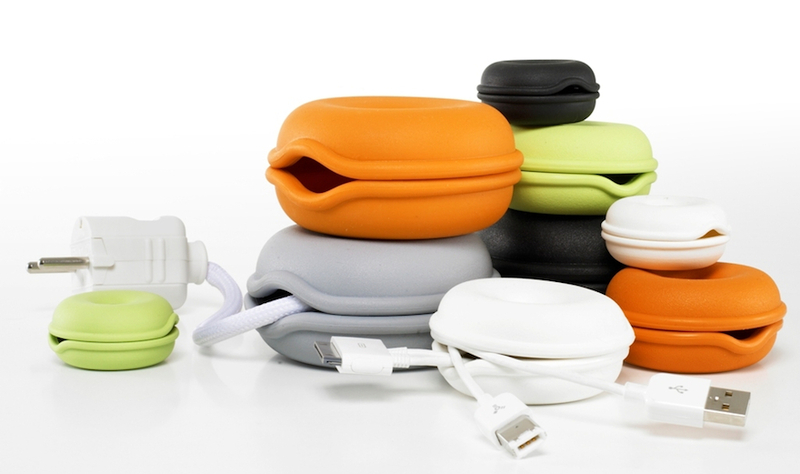 The Bobino cord wrap is about as simple as you can get. 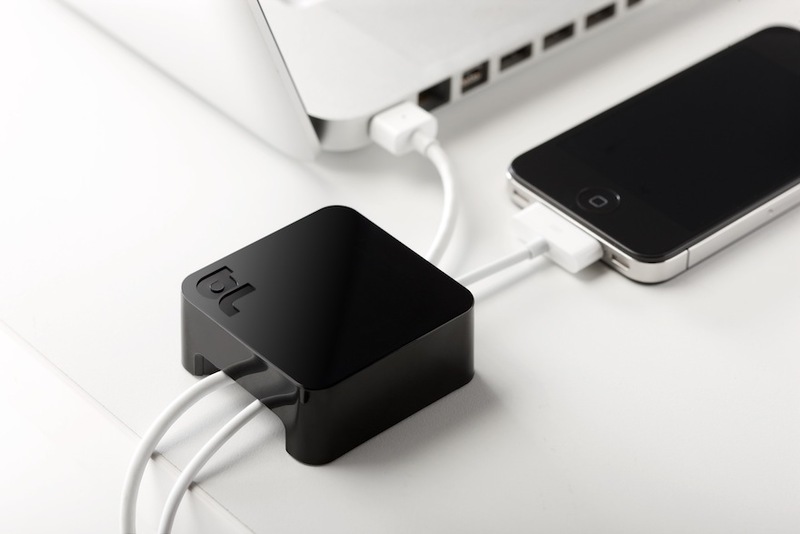 Besides using it on the desktop, end-users find this one works well for keeping cables under control when they travel. Yet another cable challenge is controlling the cables under the desk, and that's the problem that Cablox addresses. It sticks under the end-user's desk, providing an easy way to keep cables off the floor and route them where they need to go. But this obviously is not something an end-user with a glass desk would want! Another approach to routing cords is provided by the Dotz Cord Guides. Unlike the Cablox, these aren't specifically designed to be hidden away under the desk, although they could be used there. As with any of these adhesive-mounted products, the guides need to be mounted on a smooth, clean surface.